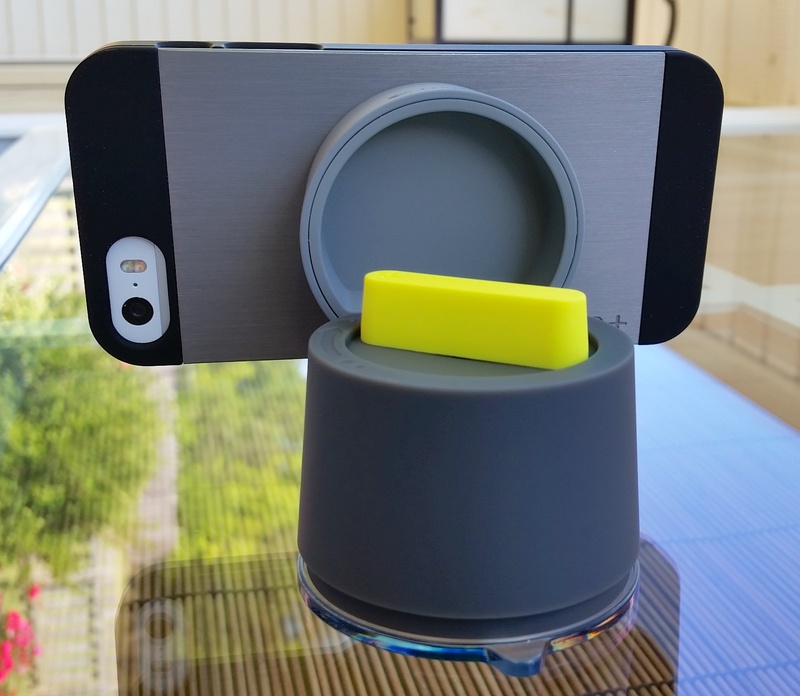 A $200 iPhone 5 or iPhone 5s case sounds insane, but after you read our Logitech Case+ review you’ll understand why this is the only iPhone 5s case I need and why I switched back after going case-less for months. The Logitech Case+ is five cases in one, and surprisingly it pulls off all of these different features incredibly well. Too often a case tries to fill more than one need and you’re left with something that only does things halfway, but that’s not the case. After using iPhone cases religiously I stopped soon after I bought the iPhone 5s, but the Logitech Case+ is the perfect iPhone case for my needs, pulling me back into the land of iPhone cases. The Logitech Case+ system for iPhone 5 and iPhone 5s. The base of this system is the Logitech Case+ that snaps around the iPhone 5s or iPhone 5. This is a slim but protective case that the rest of these Logitech Case+ components connect to with snaps or magnets. You can use this part of the case alone, or with one of the other items, which is what makes the Case+ system so nice. 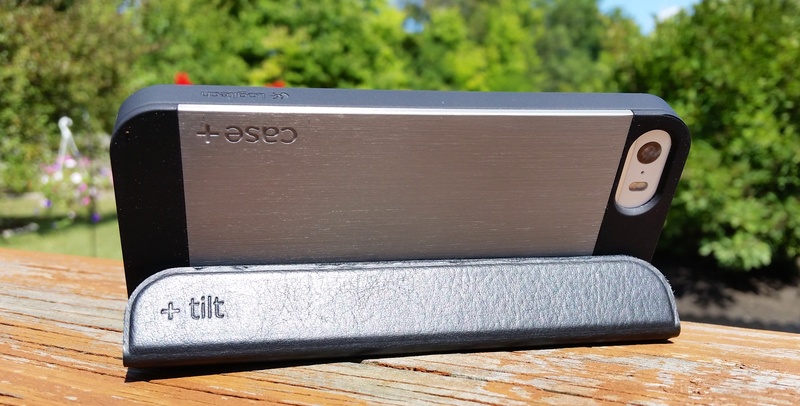 With the Logitech Case+ I have access to basic protection, a leather back that acts as a kickstand, a wallet, an iPhone battery backup and the ability to mount to a car window for travel. Unlike buying separate versions of these I don’t have to remove the actual case from the iPhone to use them, I just attach the case I need when I need it. The Logitech Case+ wallet is awesome. My biggest complaint with other iPhone 5s wallet cases is that you have your wallet with you all the time, even at home when you would rather have a slimmer package. I use the Logitech Case+ base and the slim wallet most of the time, and as soon as I am home for the night I drop the wallet on my nightstand to grab the next day. The Logitech Case+ wallet is slim with a rubber back and magnets that keep it attached to the back of the iPhone when in use. It holds four cards easily. Once you get up to four cards the fabric stretches a littles so you’ll need to stick with four cards from there on out. Pop the Case+ wallet off to connect another part of the case. 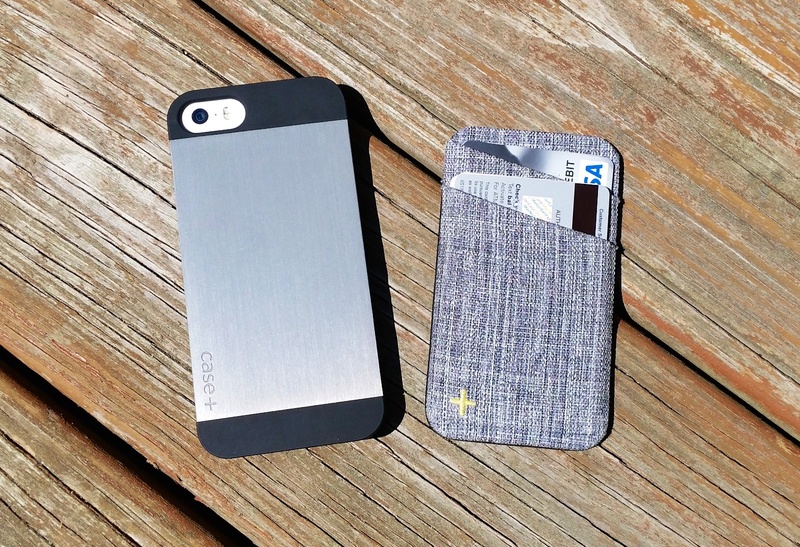 The fabric looks and feels great and this combo gets more compliments than any other iPhone case I’ve used. The color, fabric and stitching is just right. Thanks to the slim design and the rubber back it also works nice as a slim wallet that you can drop in a pocket when not attached to the iPhone. This is where the + part of the Logitech Case+ comes into play. There is a shield to prevent the magnet that keeps this in place from messing with your credit cards. 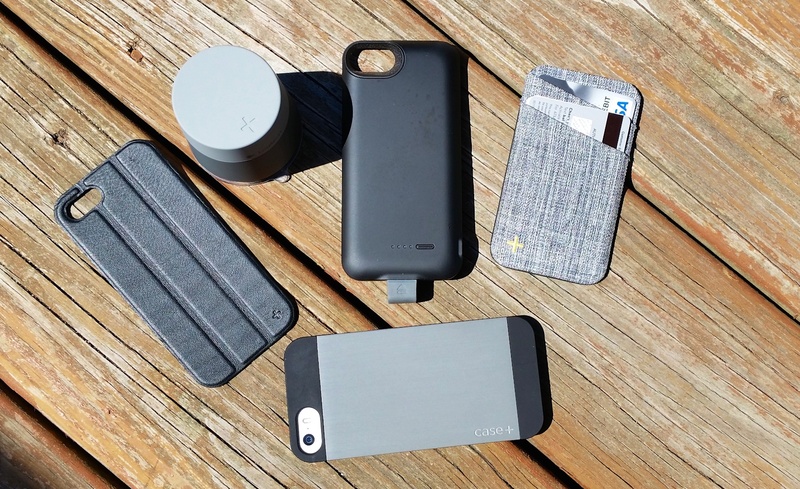 When I run out of power I can put the wallet in my pocket and grab the Logitech Case+battery that attaches by a Lightning connection and charges the iPhone. I don’t always carry this, but if I am on the go or plan on being out where I may need it I will drop it in a cargo pocket or keep it in my car. This part of the case delivers enough power to get me through a long day, without the need to switch to a second case and carry around an iPhone wallet case without an iPhone in it or switch to another wallet. 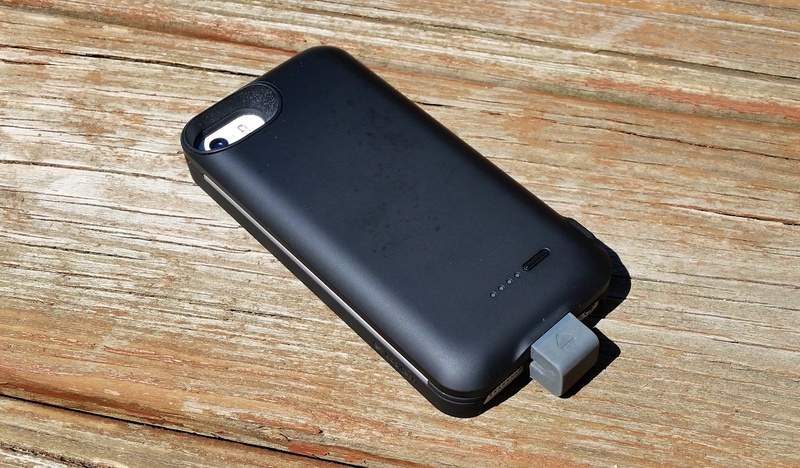 Add battery power with the Case+ battery pack. The other option that I use from time to time is the leather back that also turns into a kickstand. I don’t need a kickstand on my iPhone very often, but I like this option for those occasions where; I need a classier looking case, I want to stick my iPhone to something metal and keep it in place or it is the only device I have for a video call or watching a TV show. The lather back is a kickstand or a nice looking back. While driving the +drive part of this case connects to the windshield or to the dash using an adapter. This firmly holds the iPhone in place for navigation and you can take the +drive from car to car pretty easily. I had trouble removing the first unit from my window and the mechanism snapped, but a replacement works better going in and out of multiple vehicles over the last several months. The leather tilt back can stay on while using this, but you need to remove the other options. Attach your iPhone to a dash or windshield for navigation. Logitech includes a small metal plate that you can attach to the case of another iPhone or Android phone so that another driver that doesn’t use this system can still use the +drive car mount. The Logitech Case+ system covers the needs of four cases and a car mount, and it does each of these things very well. Logitech sells the Case+ for $199 and even though the website lists it as out of stock if you add to cart it now shows in stock. You can only purchase this as a system, and there is no way to just buy the Logitech Case+ wallet or battery without the rest of the solution.